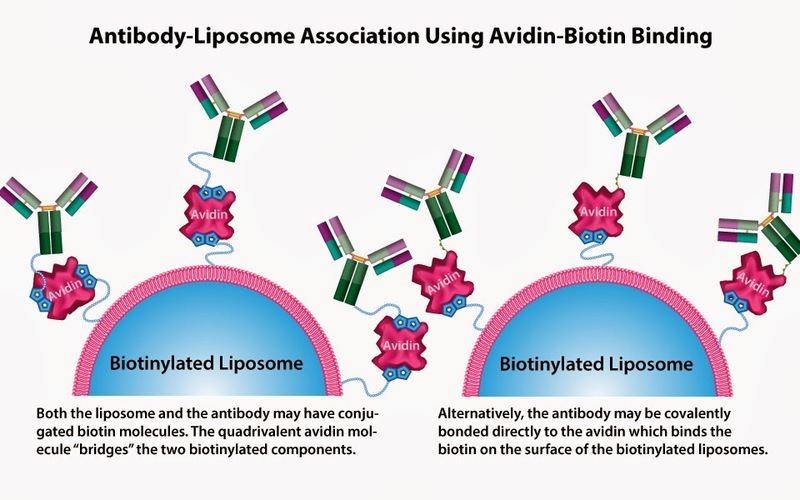 Biotinylated liposomes can be conjugated noncovalently with (strept)avidin through either direct interaction with the protein/antibody conjugated to (strept)avidin or by coupling with other biotinylated proteins using (strept)avidin as a bridging molecule. Both avidin and streptavidin form strong noncovalent bond with biotin. The high resistance to breakdown makes them very useful in bioconjugate chemistry. However, streptavidin has replaced avidin in most bioconjugation applications due to its enhance properties. 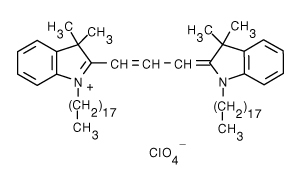 NeutrAvidin (ThermoFisher) is a modified avidin without negative properties. It performs much better than original avidin and sometimes streptavidin. In order to exploit the high-affinity interaction of biotin with strept(avidin), a two-step “sandwich” protocol (Method A) has been developed for the preparation of targeted immunoliposomes. In this methodology, (strept)avidin is first attached to biotinylated liposomes, then a biotin-modified protein/antibody is introduced into the biotinylated strept(avidin)-labeled liposomes. This noncovalent approach is rapid, extremely versatile and applicable to numerous targeting ligands of interest with respect to in vitro and in vivo applications. Alternatively, instead of forming a strept(avidin) bridge, strept(avidin) molecule can also be covalently conjugated to antibody or ligand (Method B) and non-covalently bound to liposomes containing biotin on surface in order to form immunoliposomes. ImmunoFluor™-Biotin is a PEGylated product. For other amine reactive (PEGylated and non-PEGyalated products) and also ImmunoFluor™ products suitable for other types conjugation methods see here. Laboratory magnetic stirrer is needed for dialysis. Vortex laboratory mixer is recommended to have. Float-A-Lyzer® with a proper MWCO that easily allows the cleanup of your liposome conjugated ligand from free and non-conjugated protein/peptide/ligand. You need to make sure that the MWCO is below 1,000,000 dalton. At 1,000,000 dalton, the pore size on the dialysis membrane gets close to 100 nm and therefore your liposomes can be dialyzed out. You cannot use dialysis cassettes blindly. Please understand the technique before using either spin column or dialysis cassette. If you do not use the correct MWCO, you can lose your entire prep. For this protocol, we recommend MWCO of 300,000 dalton. The total lipid concentration in ImmunoFluor™-Biotin is 22.45 mM. 1% mol of the lipid in liposomes contains PEG-Biotin group and only half of them are exposed to the outside of the liposomes, which is equal to 0.11 mM of reactive conjugatable lipid. For 2 ml volume liposome, this is equal to 2.20×10-7 mol of PEG-Biotin. Pour ImmunoFluor™-Biotin in a conical tube and vortex it gently with one hand. 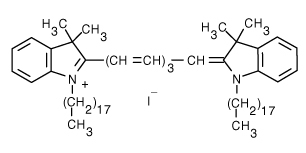 Use the other hand and slowly add the (strept)avidin solution until the two solutions are mixed. You need to use 10-fold molar excess of strept(avidin) to Biotin lipid. Incubate the solution for 1 h at room temperature. Remove the unbound (strept)avidin from the prep by dialysis. We prefer dialysis to size exclusion columns. Dialysis is a much slower process but there will be minimum loss of ImmunoFluor™-Biotin after the prep is cleaned from unbound (strept)avidin. Spin columns are much faster; however, you can easily lose over 50% of the liposomes on the spin column. We recommend using Float-A-Lyzer® dialysis cassette with 300K MWCO from Spectrum Labs. Dialyze the ImmunoFluor™-Biotin/(strept)avidin solution in 1 liter of PBS at pH 7.4 for 8 hours. Change the dialysis buffer with a fresh 1 liter of PBS and let it dialyze for another 8 hours. After this step, ImmunoFluor™-Biotin/(strept)avidin is separated from unbound (strept)avidin. Pour ImmunoFluor™-Biotin/(strept)avidin in a conical tube and vortex it gently with one hand. Use the other hand and slowly add the biotinylated antibody or biotinylated ligand solution until the two solutions are mixed. You need to use 2-fold molar excess of biotinylated antibody (ligand) to Biotin lipid. Incubate the solution for 1 h at room temperature. Remove the non-conjugated antibody or ligand from the prep by dialysis by using Float-A-Lyzer® dialysis cassette with 300K MWCO from Spectrum Labs. Dialyze the immunoliposome solution in 1 liter of PBS at pH 7.4 for 8 hours. Change the dialysis buffer with a fresh 1 liter of PBS and let it dialyze for another 8 hours. After this step, your cleaned up immunoliposome solution is ready to use. The total lipid concentration in ImmunoFluor™-Biotin is 22.45 mM. 1% mol of the lipid in liposomes contains PEG-Biotin group and only half of them are exposed to the outside of the liposomes, which is equal to 0.11 mM of reactive conjugatable lipid. For 2 ml volume liposome, this is equal to 2.20×10-7 mol of PEG-Biotin. Pour ImmunoFluor™-Biotin in a conical tube and vortex it gently with one hand. Use the other hand and slowly add the antibody conjugated strept(avidin) until the two solution are mixed. You need to use 2-fold molar excess of antibody conjugated strept(avidin). Incubate the solution for 1 h at room temperature. ImmunoFluor™ liposomes are unilamellar and sized to 100 nm. The molar concentration of liposome is 10 mM. By having liposome diameter (nm) and lipid concentration (µM), you can calculate the total number of the lipids in one liposome and the number of the liposomes in one milliliter of the liposome solution. To use the calculator click here. To avoid precipitation of lipid in the noncovalent approach, care needs to be employed in maintaining a high ratio of strept(avidin) to biotin-liposomes. Otherwise, the coupling efficiencies would be relatively low. Alternatively, Sepharose® CL-4B size exclusion spin column can be used instead of Float-A-Lyzer®. However keep in mind that a large amount of liposomes will be loss on the column during the process. Dialysis is a much slower process that size exclusion however there will be minimal loss of liposomes. If you decide to use a dialysis cassette, you will need to make sure that the MWCO is below 1,000,000 dalton. At 1,000,000 dalton, the pore size on the dialysis membrane gets close to 100 nm and therefore, your liposomes can be dialyzed out. You cannot use dialysis cassettes and spin columns blindly. They come in various sizes and you need to choose the correct size wisely. ImmunoFluor™-Biotin formulation is colored and the color depends on the type of the fluorescent dye that is used. Usually due to the small size of liposomes no settling will occur in the bottom of the vial. The liposomes are packaged in an amber vial. ImmunoFluor™ products should always be stored at in the dark at 4 °C, except when brought to room temperature for brief periods prior to animal dosing. DO NOT FREEZE. If the suspension is frozen, the encapsulated drug can be released from the liposomes thus limiting its effectiveness. In addition, the size of the liposomes will also change upon freezing and thawing. ImmunoFluor™-Biotin is made on daily basis. The batch that is shipped is manufactured on the same day. It is advised to use the products within 2 months of the manufacturing date. 2. Loughrey HC, Choi LS, Wong KF, Cullis PR, Bally MB. Preparation of streptavidin-liposomes for use in ligand-specific targeting applications. Liposome technology. 1993;3:163-78. 3. Haugland RP, Bhalgat MK. 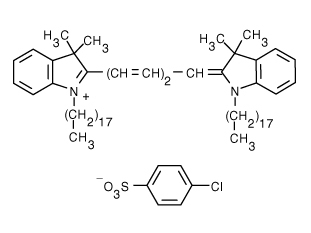 Preparation of avidin conjugates. Immunochemical Protocols. 1998:185-96.